Perfect Central Position - Simplistic in Style. We are in the perfect location for walking to many great tourist attractions, restaurants and shops. The Cashel Mall Re:Start is an easy 15 minute walk and the Christchurch Casino just 5 minutes away. Victoria Street with its many great restaurants, cafes and galleries a 2 minute walk from our property. For a pleasant stroll or energetic run Hagley Park and the Botanic Gardens are 5 minutes away. Southern Cross Hospital and diagnostic clinics are also just a 2 minute walk away. We are pleased to announce that we are now offering free WiFi to our guests in all suites. Having listened to what our guests expect and following local trends we know you will enjoy this added benefit when staying with us. Book directly via our website or give us a call on 0800 777 440 to ensure best rates and benefits available. We are the closest 5 star luxury accommodation to the new look Victoria Street. A two minute walk takes you to some old favourites such as Saggio di Vino, Blax and the newly reopened Carlton - a Christchurch icon. Johnny Schwass has returned to the Christchurch dining scene with his new Harlequin Public House, something a little different in dining style. Tequila Mockingbird Tapas Bar and Restaurant offers a wonderful Latin dining experience. The list of great dining options is extensive so why not visit Christchurch now and sample what is on offer. It is great to see the Christchurch Gondola fully operational again. Also the Tram is back on the tracks and ready and waiting to transport visitors around the city. Punting on the Avon is still a great way to relax and view the sights from the river. They do provide warm blankets if the days are a little chilly. The new Visitor Centre at the Botanic Gardens, officially opened by the Duke and Duchess of Cambridge, is an outstanding architectural achievement. 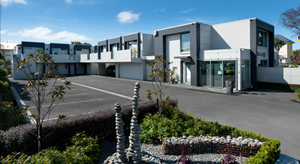 This is a 'must see' when visiting Christchurch.The Centre has a dedicated gallery space with displays that explore the world of plants in Christchurch. The shop offers botanical, garden and nature-inspired gifts and books. Regularly stay in Christchurch? - Time for a change? If you visit Christchurch regularly on business and routinely stay in the same accommodation, why not consider a change? We would be happy to talk to you about our very competitive corporate rates for guests who stay on a regular basis. Also very agreeable to putting together a package which could include continental breakfast and WiFi access. Phone 0800 777 440 or email today to discuss your requirements. © 2010-2013 Bellano Motel Suites.